How this startup can produce tonnes of fruits and vegetables without soil. Hydroponics farming in India has been steadily growing over the past decade and is becoming a more viable option in today’s agricultural climate where our reliance on water and pesticides is at an all-time high. This has lead traditional agriculture to become blatantly unsafe and unsustainable. Hydroponics is a method of growing plants in channels or buckets of water. This method can be used to grow multiple varieties of crops such as lettuce, basil, spinaches, tomatoes etc. Future Farms has been one of the pioneers of hydroponics in India and Hydroponics in Tamil Nadu. Future Farms leverages new technology and improved crop production methods to grow multiple crops in their rooftop farm in Chennai using hydroponics. Hydroponics in Tamil Nadu is a difficult proposition with the state’s soaring temperatures and harsh monsoons but Future Farms is able to grow even cold weather crops like lettuce throughout the year with the help of the NFT(Nutrient Film Technique) Hydroponic method and accompanying climate control technologies to enable the year-round production of crops. Future Farms is able to grow tonnes of fresh veggies and fruits and supply them locally for consumption using hydroponics in Tamil Nadu. 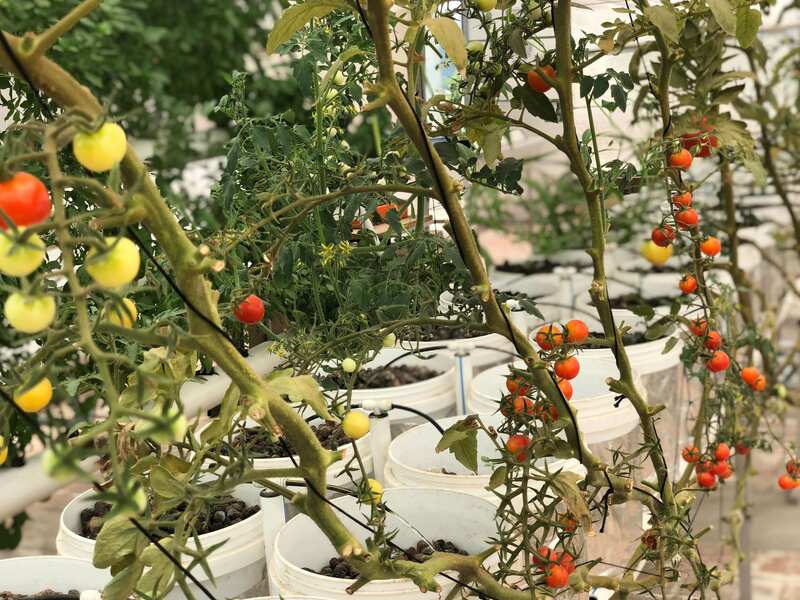 They are able to grow tomatoes and melons year round in their rooftop farm in Chennai with the help of the modern technologies used in monitoring and dosing plants as well as IOT based climate control technologies to give the crops the best environment and feeding schedule so as to get the best growth possible. Hydroponics in India can solve two of the biggest challenges to do with soil based farming of which the first is reliance on monsoons and water and the second is the heavy use of pesticides and fertilizers. Hydroponics in Tamil Nadu is seeing a new lease on life with Future Farms. Being a very Industrial state, Future Farms is using hydroponics in Tamil Nadu to set up farms that work as food factories keeping with the industrial tune of the state. Hydroponic farming in India is, therefore, seeing a surge in viability due to this company ’s flawless execution of technology and agronomy to tackle the problems posed by soil farming. This has helped them rack up over 5 acres in hydroponic farms in India for corporates and Individuals. Some Corporates that have engaged with Future Farms to join the revolution of Hydroponic farming in India are Adani Group, Dabur, Mcdonalds and Kalpatharu among other. FutureFarms has also collaborated with land developers, Agro companies, and individuals and set up several Hydroponic farms in Tamil Nadu and other parts of the country. They have set up 30 such Hydroponic farms in India. With Future Farms, Hydroponics in India will surely become a more viable and commonly used method to produce greens, vegetables, and fruits without any of the constraints of soil farming and achieve sustainable year-round farm production.